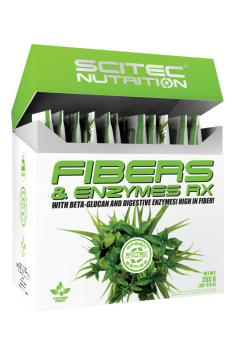 Fibers & Enzymes RX 30 sach. Mix the content of one sachet of the product (8,5 g) with your favorite drink (recommended protein shake). Drink once a day. Do not exceed the recommended daily dose! A diet rich in fiber is very healthy. However, sudden addition of too much fiber to the menu should be avoided, because it can cause the formation of gases in the intestines, aches and cramps in the abdomen. By gradually increasing the fiber dose, bacteria in the intestines have a chance to adapt to its quantity and the risk of side effects is reduced. The product can be taken as an additive to your favorite drinks. Well suited to the protein shake after training. This supplement is tasteless, so you can add it without worrying about the adverse change in the taste of the prepared drink. Peanut paste with xylitol and sea salt. Contains no sugar and palm oil. GMO-free.